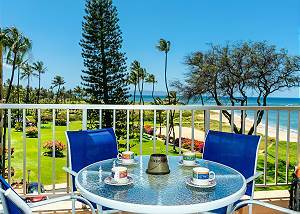 Menehune Shores is a beachfront property located in North Kihei. It is made up of six stories in a horseshoe shape overlooking the sparkling Pacific Ocean. Beautiful palm trees and manicured landscaping lead you right to the ocean. Next door is an ancient 16th century fish pond of Kalepolepo and the National Marine Humpback Sanctuary. From the Menehune Shores condos, you can enjoy incredible views of the West Maui Mountains as well as neighboring islands which makes sunsets a treat. These comfortable one, two, and three bedroom vacation condominiums nearly on the beach await you! Wake up early and you can walk a few steps from your condo and greet the sun on the beach. Your vacation condo rental will be equipped with everything you need for an outstanding stay in paradise. Full kitchens are provided for you to whip up meals for your party. Your Menehune Shores condo will be a great place for you to relax and entertain. With the addition of a private lanai, nights become more fun enjoying drinks with friends or outdoor dining. The Menehune Shores provides a relaxing atmosphere and it will be easy to unwind in your vacation rental after a long day of sun on the sandy beach out front. A sparkling swimming pool nestled within the grounds will be the perfect place for you to cool off and splash around with the kids. Menehune Shores also has the ultimate grilling experience! From the rooftop lanai, you can make use of the barbecues and it seems like you are grilling on top of the Pacific Ocean. Picnic tables are provided - so for a great night have a family barbecue on the roof at sunset. The beach out front is perfect for playing in the waves, a casual beach walk, or even setting up a picnic! At Menehune Shores condos, you will have many conveniences nearby! There is an on-site restaurant called Monsoon India, which serves Indian food specializing in Tandoor and Southern Indian dishes. There is also an ABC convenience store a few minutes away and about a five minutes drive towards South Kihei, there are supermarkets, fine dining, and shopping possibilities. Menehune Shores' unique property layout, including rooftop lanai, thoughtful property features, and location, complete with the Sanctuary next door, combine to create the perfect holiday environment. Book a condominium at Menehune Shores for your next Hawaiian vacation and you'll make magical Maui memories that will last a lifetime... or until you book Menehune Shores again!